Acceptance is the greatest gift we can give to those who may be different in some way. I was fortunate to have learned early in life to accept those who were not just like me, I was also fortunate to be accepted by them in return. My mother taught me well, I played with children who were different and they played with me, I never knew others shunned them or judged them until I was blessed with a life changing event, a moment in time which cemented my resolve to help and advocate for those others would not. I’m not certain just how old I was, perhaps twelve or thirteen, right around the age I felt I was too old for Girl Scouts but wanted that last badge. My girl scout troop was invited to a place called Hope Cottage. It was a home for physically and mentally disabled people. It was an emotional day for all of us; it would be years before I grasped the full meaning of all that transpired during our visit. From the outside looking in, it was a building like any other, nothing fancy, maybe even a little run down. When we stepped through the doors, we entered into a world we never even knew existed. As I looked around, I noticed a young man, sitting alone. He seemed to be having the most wonderful conversation with someone only his eyes could see. Not too far away sat another boy, rocking to melodies only he could hear. A girl, older than me judging by her size, was seated in an adult sized high chair of sorts, being spoon fed by one of the care givers. Her name was Joy and I will never forget her. As our guide was introducing us, one of the girls in my troop noticed Joy had on a rather large diaper peaking just above the waistline of her pants and began to giggle and whisper about it to her companion. They were both taken from the room immediately. Joy just smiled an innocent, unknowing smile and turned back toward her meal. Suddenly the room began clapping for her! “Good word Joy!” She beamed, she absolutely beamed. I couldn’t help but smile even as a tear fell from my eye. I was asked if I wanted to leave, but I didn’t, I couldn’t. I remember looking around the room at the drawings decorating the walls. Some of them could have easily been drawn by toddlers while others were amazing works of art. It was as I looked upon one of these portraits, a young man whispered, “That’s mine.” I smiled as I told him it was a beautiful picture. I had no idea then it was his, a glorious work of art created by a boy who lived his life somewhere along the autistic rainbow. Joy began to cry as the oatmeal was being wiped from her chin, I found myself by her side offering words of comfort. Her big baby hand took hold of my arm, the woman firmly said “Be soft Joy.” She was. She smiled at me; she truly was a beautiful baby. Before I knew it, we were being rounded up to leave. I think part of me did not want to go and the other part of me wanted to run and never come back. I experienced many emotions in the days and weeks to come. I felt sadness, confusion, pity, perhaps even anger. Soon, my sadness faded as I realized they were not sad. I’d not seen frowns on the faces of those children, I’d seen beautiful smiles. My confusion vanished with the help of my mother’s wisdom. I realized I had no right to pity them; they did not want it or need it. Any anger I may have felt was fleeting, it was more of a helpless type of anger. The sort you feel when you think you should be able to change something you know you cannot. Years later I drove past the run down home and saw a mansion. I looked past the unkempt grounds and the peeling paint and saw a mansion. Through the window I saw angels. I have always wondered if they were the children who resided in the cottage named Hope or if they were the care givers who kept watch over them. Maybe they were all angels, simply here to teach us and touch our lives. That day changed my life forever. Maybe it was that day, as I looked into the eyes of Joy; God decided he would bless me with children who would require a little more than most. Children who would hear melodies I could not. Children who would live in a rainbow of colors I would not always be able to see. I often think of the young girls who laughed and I hope they learned something from their experience, I hope they took something home and taught it to those who should have taught it to them. I think of the girl who could not stop her tears from flowing and I hope she found peace and understanding. Our world is made up of more than color and social status, more than what we see with our eyes, we have to look with our hearts as well. We owe it to our children and their children’s children to make the future a place where all are accepted and never will there be a need to ask if children should be exposed to angels . . . I will never forget that day. 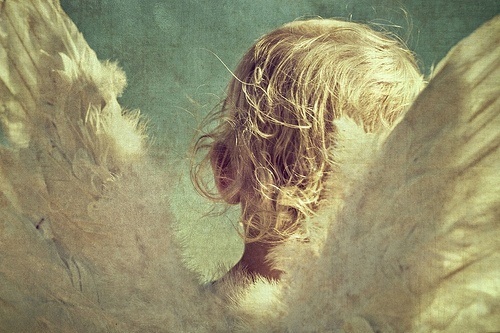 I will always be thankful I was given the opportunity to stand among angels, holding hands with Joy, in a place of Hope.